Sales of newly built homes in the U.S. endured a rocky 2013, ultimately amounting to roughly half their historical annual rate after being whipsawed by rising interest rates, the fitful economic recovery and buyers cowed by high prices. Economists widely expect this year to deliver better results for home builders and buyers alike, as long as several factors such as job growth, credit availability and consumer confidence continue to improve. The National Association of Home Builders expects 2014 new-home sales to tally roughly 600,000, a heady increase of roughly 40% from the 2013 total. Estimates released Monday by the U.S. Census Bureau shows that new-home sales totaled 428,000 in 2013, up 16.4% from the 2012 figure of 368,000. Last year’s increase was the third consecutive annual gain after a steep decline from nearly 1.3 million in 2005 to a nadir of 306,000 in 2011. Here’s a look at five things that economists expect will boost the new-home market in 2014. Newly hired workers don’t often rush out to buy a house. However, more tenured workers often are more likely to buy a house if continued hiring by their employers indicates their jobs are secure. The U.S. labor market added jobs at an average monthly rate of 182,000 in 2013, according to the U.S. Bureau of Labor Statistics. Economists surveyed by The Wall Street Journal expect that rate to increase to roughly 200,000 per month this year as companies gain more confidence and spend more freely. David Crowe, chief economist at the National Association of Home Builders, anticipates that the increased hiring will unleash pent-up demand from would-be buyers who were too uncomfortable to buy in recent years. 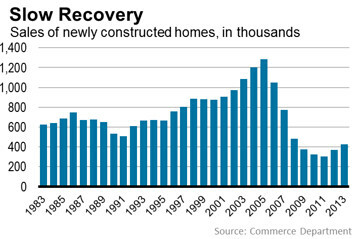 “For home buying, employment growth has more to do with providing comfort to those who have a job,” Mr. Crowe said. In addition to jobs, some would-be home buyers might get more access to credit this year. Several economists expect that lenders will slightly loosen credit standards this year as they get more comfortable with new federal guidelines for home lending. In addition, lenders will need to turn to originating more purchase loans as the market for refinancing shrinks with higher interest rates. Some of that already has started, if only in a minor way. The average FICO score for a purchase loan backed by Freddie Mac or Fannie Mae in December was 756, down from 761 a year earlier. “Credit availability is going to be very important to the housing market in 2014, particularly in the context of rising interest rates,” said Mark Zandi, chief economist at Moody’s Analytics. Average FICO score for a purchase loan backed by Freddie Mac or Fannie Mae in December. The generally bullish forecasts of many economists and analysts for this year’s new-home sales could fall flat if just one important variable goes against them: interest rates. A 1 percentage-point rise in interest rates last year from May to September was enough to turn a resurgent new-home market into a relatively stagnant one. The interest-rate spike, combined with builders’ aggressive price increases earlier in the year, pushed many buyers to the sidelines. Rates for a 30-year, fixed-rate mortgage have slid back from their recent high of 4.53% early this month to settle last week at 4.39%. The concern is that rates might rise if investors and lenders get nervous about the Federal Reserve’s efforts to scale back its monthly bond-buying program aimed at stimulating the economy by keeping rates low. A 1-percentage-point increase in interest rates typically can add $100 or more to the monthly payment on a new home loan. No doubt, interest rates will rise this year since they still are near historic lows. Lawrence Yun, chief economist for the National Association of Realtors, predicts that rates will rise to 5.3% by the end of this year. 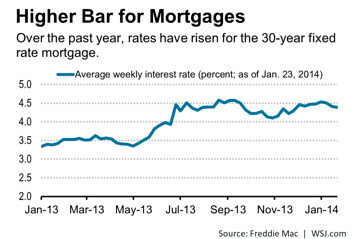 The key, he and others say, is a slow and steady rise in rates rather than a jolt like last year’s. As builders ramp up their production, which increased last year but still remained well below the historical annual average, the additional supply likely will help to bring more first-time buyers back into the market. Builders started construction of 923,400 residential units — both single-family units and multifamily units — last year. That was up from 780,600 in 2012 but still well less than the historical average of roughly 1.6 million to 1.7 million a year. 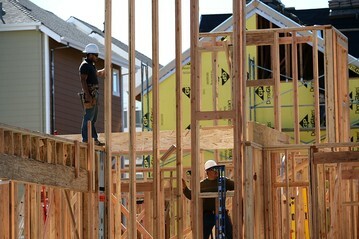 Many economists are projecting home construction to pick up this year to 1 million to 1.2 million units. Some of that will result from the supply of build-ready lots catching up to demand. It also might be aided by a relative scarcity of existing homes on the market. According to the National Association of Realtors, the supply of existing homes listed for sale in December would take 4.6 months to exhaust at current sales rates. A normal supply is considered to be six months to 6.5 months. If most or all major factors fall in favor of an improving economy, that bodes well for another force in new-home sales: Buyer confidence. Last summer, a lack of buyer confidence due to rising rates, high prices and political uncertainty in Washington, D.C., became one of the reasons that the new-home market lost momentum. That decline occurred even as new homes were relatively affordable and interest rates low by historical standards. This year, if job growth and other economic indicators continue to improve, it can have a snowball effect with buyers.